From New York City designed on a hanger to San Francisco built entirely out of gelatin, check out these urban-inspired creations and find out exactly how the artists pulled them off. 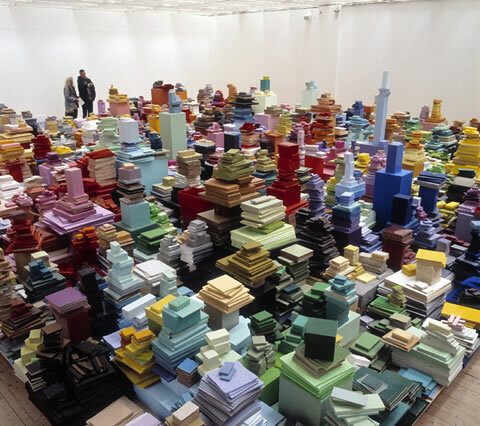 Created twice—most recently in 2010 for the A Foundation in Liverpool—this city portrait (which isn't modeled after any specific metropolis) was built with stacks of painted wood, books, sponges, food, bricks, videotapes and more. Photo courtesy of Jacob Dahlgren. Built over a period of 40 hours in 2010, this work—installed in the atrium of Northern Trust in Guernsey, Channel Islands—features over 100,000 staples. Root is currently working on a larger version, which will employ one million staples. Photo courtesy of Peter Root. Featuring $60 worth of Guernsey potatoes—which Root diced, sliced, cut, stacked and balanced over a period of two weeks—“Wasteland” was exhibited at the Park Street Studios Retrospective in Guernsey, Channel Islands in 2009. To create the ruined appearance, Root let the potatoes deteriorate for two months. Photo courtesy of Peter Root. 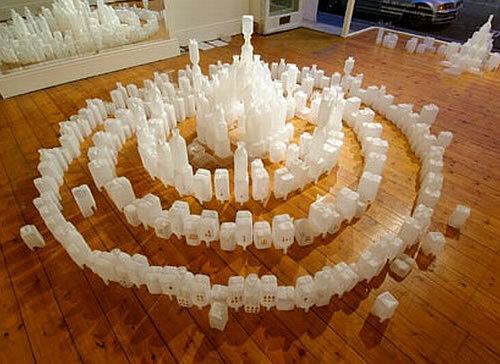 Built out of 1,400 discarded plastic food containers found throughout London, “Atlantis” has been displayed in seven galleries since its 2008 creation. Currently at Galleria Uno + Uno in Milan, the mythical city is meant to echo the modern day tourist destinations that are visited en masse with little regard for local ecosystems. Photo courtesy of Alberta Pane and Gayle Chong Kwan. This modern-day version of Rome, rendered in Corten laser-cut steel, was created to commemorate the Great Fire of 64. Made in 2009, the piece outlines iconic structures like the Colosseum and St. Peter's Basilica. (This was created in tandem with a model of the London skyline, which was similarly destroyed in a fire in 1666, and is thus named "1666".) Photo courtesy of GSpotDesign.IT. 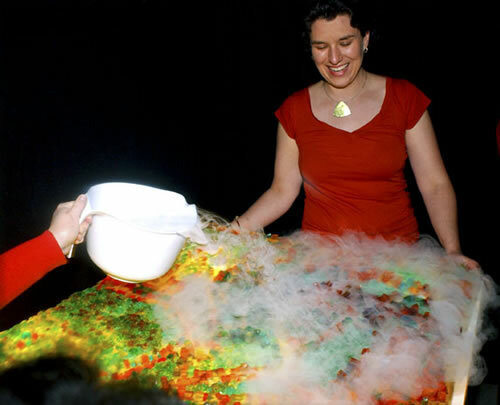 This foodscape (food landscape) was commissioned in 2009 by the Good Food Channel. 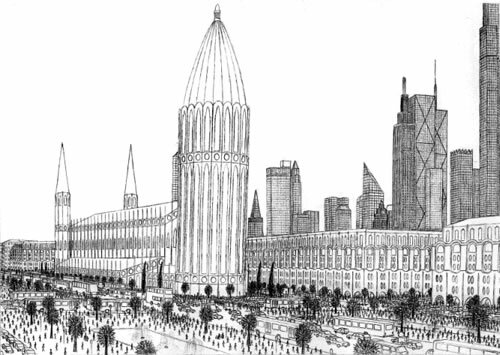 Among Warner's renderings of London's landmarks, he designed, set and photographed leek, cucumber and cloves for The Fire of London Monument; bread and cereal for Canary Wharf; melon and green beans for The Dome, and beans, celery, pineapple and more for the Tower Bridge. Photo courtesy of Carl Warner. 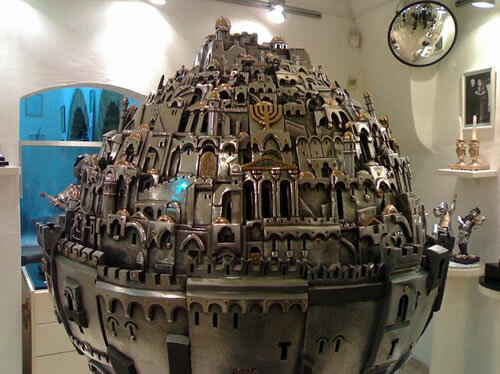 Displayed at King Solomon Hotel in Jerusalem during the late 1970s, this spherical sculpture—made of pewter with gold and silver plating—represents how Jerusalem was viewed in the Middle Ages: circular, and the “navel of the world” with seven symbolic gates. Photo courtesy of Frank Meisler. 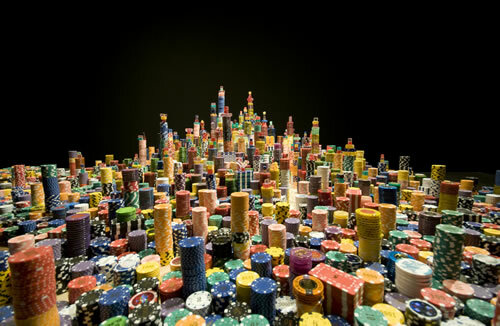 In 2008, the Chinese artist created this installation of Shanghai, his home city, out of poker chips and dice. 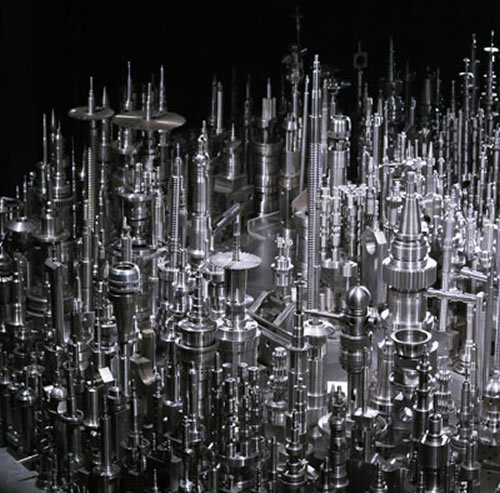 The piece later earned him a solo exhibition at Galleria Continua in San Gimignano, Italy. Photo courtesy of Alessandro Casagli via Flickr.com. 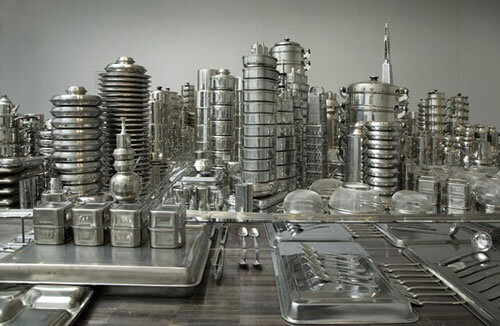 This topographic San Francisco cityscape—featuring landmarks including the Ferry Building and Terminal—is made with stainless steel kitchenware, including tongs, graters, pots, serving dishes, tea kettles and more (all made in China). 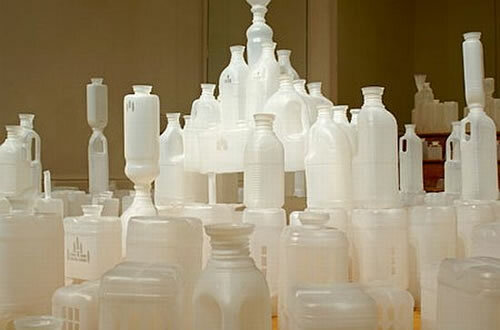 The piece was on display at the Asian Art Museum in San Francisco from February through May 2008. Photo courtesy of the Asian Art Museum. In 2007, the Manhattan-based artist created this work for a spread in Institutional Investor that discussed the financial relationship between Hong Kong and mainland China. It's made out of color copies of Chinese yuan that Rixford and her husband, Mayhew Lu, collected during their travels. Photo courtesy of Ellen Rixford. 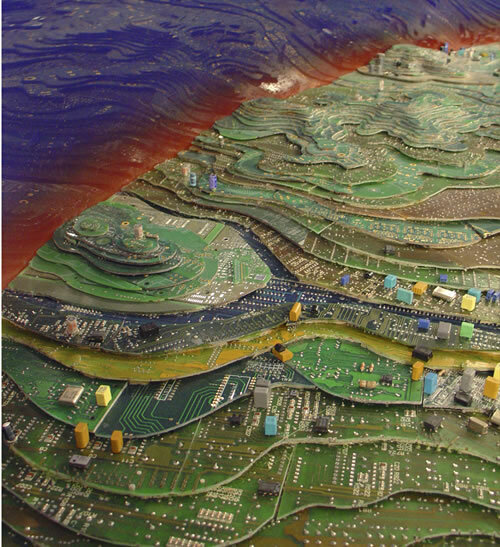 In 2005, the San Francisco–based artist created two editions of this piece as part of a five-year project by constructing models of different San Francisco landscapes, which she then used to make molds. After adding backdrops—including mountains, trees and bridges—Hickok illuminated each scene using refracted light for a photo series. Photo courtesy of Liz Hickok. First designed in 2004 by Christopher Jarratt, these custom-designed hangers are made with birch plywood, hand-sanded and finished with a clear water-based lacquer. Meant to function as both wall art and an actual closet hanger, they depict the five major fashion capitals of the world—New York (shown above), London, Paris, Tokyo and Milan. Photo courtesy of Chris Jarratt and HookPegSupport. 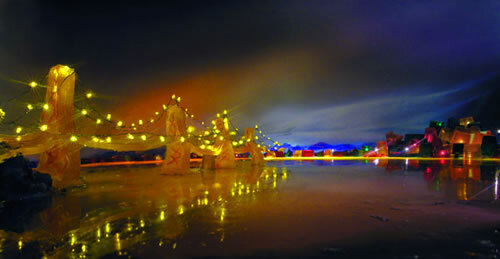 And More Unusual and Creative CityScapes...! 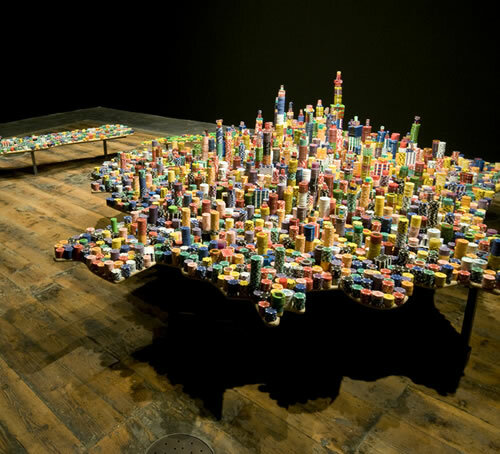 Chinese artist Liu Jianhua created this cityscape of Shanghai out of poker chips and dice. You can fill in the part about the metaphor of a city's growth and economic development to risk taking, gambling, and chance all by yourself. Part of a solo exhibition at Galleria Continua in San Gimignano, Italy. Liz Hickok and her Twin Peaks in Jell-O, complete with "fog." 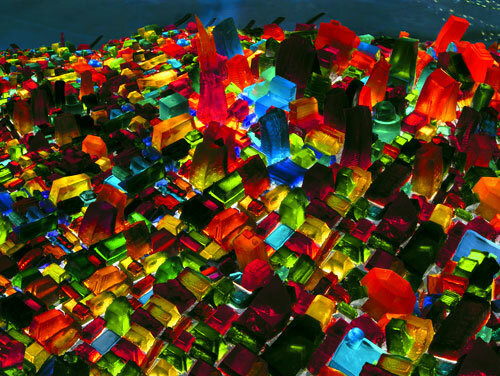 San Francisco may be prone to earthquakes, but things never seem so jiggly as when artist Liz Hickok made a cityscape of Baghdad-by-the-Bay out of ... Jell-O! In his installation titled "Eating the City," Chinese artist Sang Dong used about 72,000 biscuits, including "digestives, chocolate digestives, rich tea, hobnobs, caramels and fruit shortcake." When his assistant remarked that she wanted to have a biscuit or two after the exhibition was completed but worried whether the biscuits would be stale, Dong had a sage advice: "Go for the ones at the bottom." Urville is an island off Côte d'Azur, between Cannes and St. Tropez. If you've never heard of it, that's because it exists only in the mind of a savant named Gilles Tréhin.